Hey guys- I have an ES-Les Paul and have some interest in possibly adding a Bigsby or Bigsby type vibrato to the guitar. Has anyone installed an after market Bigsby (I believe B7 is the model for an ES-Les Paul). Im also interested to hear if anyone has installed another type of vibrato to an ES-Les Paul. Xtreme Long Tail Vibrato is another option that I have looked at and much cheaper than Bigsby, although some modification is required. Any comments would be appreciated as well as any pics you can add. Warranty. No holes or physical modifications. It can be completely reversed to Original..
A b7 and vibramate is ok, but a b3 and a Towner bar looks much better. definitely go with the vibramate option, you don't need to start drilling holes in your guitar, this will avoid that. the B7 is the "correct" bigsby to use on LP. I'm not sure if a B3 would work, maybe..
Duesenberg has a vibrato which is easily to install on the Gibson tail piece and it is less invasive than the Bigsby. the name is Les Trem II, it should be an interesting alternative. Watched the You Tube & it doesn't fit together smooth & even...... The Bigsby is elevated above the Guitar & the End Piece looks way exaggerated. Not a very clean look IMO. Just to give an idea, B7/V7, no mods, about a 20 minute job to install. I use Big Bends Nut Sauce on all contact points, tuning stability quite good. Really appreciate everyones response- and thanks for the attached pictures. Not ready to pull the trigger yet but I'm glad there are more than one option. A word of caution, possibly not needed, BUT:You are asking about an ES-LP, not an LP. A lot, if not all responses are for LPs, not ES-LP. Obviously different construction. I'd want to be absolutely positive that whatever is done is appropriate for for the ES. They do come with a Bigbys, so obviously it is possible. It just may be that certain types are not. Again, I don't know that there is any differences of consequence, but someones opinion is only worth so much when it is *your* guitar. Here is a shot of the mahogany block inside of the ES Les Paul...…….. Not much wood...….. Similar concept to an ES335 345 & 355... Works pretty well with them & it works equally well on Les Paul's. How is a mostly hollow LP-ES in any way even remotely like a full block ES335, 345, 355 for screwing a trem to the top? The issues are NOT being able to screw to the top and the trem length. 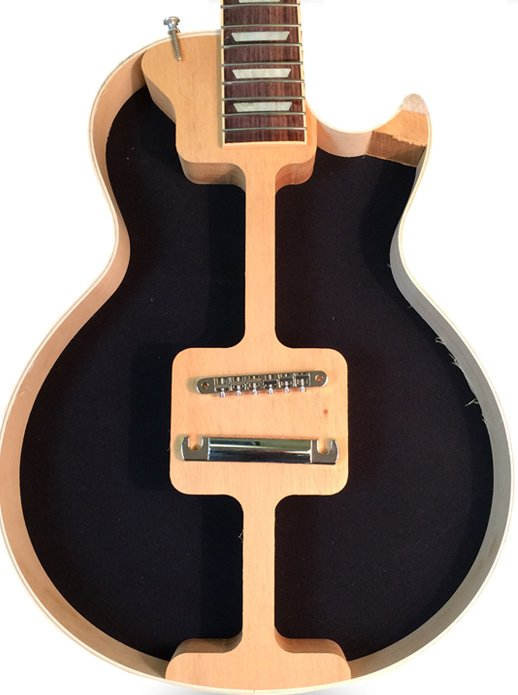 I have a B-6 removed from my hollow ES-195 and while the hinge plate "may" fit (it may be too long on the rim) its length is (IMO) too long for my LP-ES and would be too close to the bridge. I've seen very few LP-ES with a Bigsby and it looked W-R-O-N-G being IMO too close to the bridge and having screws in the hollow top. If I HAD to do that a B-6 is a better bet even if I had to change the hinge plate with a Towner B6 thin rim replacement plate. OP, I'd call Bigsby to make sure what you buy is right for the LP-ES. My conversation was about adding Bigsby's or Trem's that were completely reversible. NONE of the LP-ES Bigsby installations were reversible, well invisibly anyway. They ALL screwed to the top, look them up at Reverb, there are only two or three, all have two screws in the top. A Bigsby B7 has two screw holes. If they're not used, then that's OK BUT the baseplate screw holes will ALWAYS be there, no? Some of you ****ers like to argue for the sake of argument don’t you. A factory B7 will be screwed to the very strong and ample maple top. It does not matter if the body is hollow, has a center block, or is packed with fudge. It also will NOT have the bushings for the stop tailpiece installed. If you want to add a bigsby after the fact, the tailpiece bushings need to be covered or utilized in the set up. The vibramate and Towner do just that with out drilling holes. Some of you ****ers like to argue for the sake of argument don't you. No, we're trying to steer the Op in the right direction. It's called discussion, that is until YOU came up with "Some of you ****ers like to argue for the sake of argument don't you."